A few weeks ago when I was driven to nostalgic rhapsodies over a band called The Janglebachs, who explain themselves as “A Tribute to The Music Of The Woodstock Generation,” but for me represent so much more. As I watched the aging but agile musicians unload a van dangling a handicapped tag in the windshield, I was transported to grandma’s basement, the summer of 1966 when the tunes were often sweet and silly, sometimes rebellious, but most always joyful. The now graying guitarists were still in junior high school then, picking their way through The Beatles, The Rolling Stones, The Yardbirds, The Young Rascals and more with an enviable intensity. It was a tender time when everyone I loved most was still alive and the world thrummed with possibilities. The thrill of hearing songs that formed a lifelong love of music was matched only by pride of association. “The Heard”, Summer 1967. Pictured from left to right: Joe Goulait, Garry Barrett, Ellen Rosch, Phil Schaeffer and Steve Rosch. 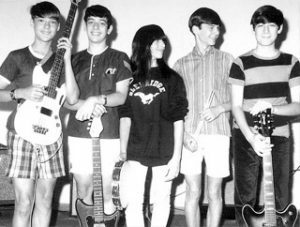 The members of the fledgling basement band, The Heard, included my Uncle Garry, a mere six years my senior, Ellen Rosch, Phil Schaffer and two of the current members of The Janglebachs, Steve Rosch and Joe Goulait. They played pool parties, weddings, high school dances, anywhere they could get a gig. Mom was their manager and I was, without peer, the coolest kid on the block when they deigned to rehearse in our own basement. Though they went their separate ways in 1968, none of them gave up the music, continuing to play in various bands over the years. Uncle Garry went on to play with bands in California and later in Austin, Texas. When I heard through the grapevine that Rosch and Goulait reunited, fleshing out the band with Bassist Tom McDuffee of New Market, Drummer Mike Ross of Ellicott City and Baltimore Vocalist Vicky Blacker, I was in crimson and clover all over again. Seeing them plugging in their guitars again after almost fifty years was a tonic to my middle-age angst. Hearing them revive the hits that “keep on keeping on” was like revisiting a milestone on a really pleasant road. And why not? If The Turtles can still be happy together and Blue Oyster Cult is still braving the advent of the reaper, why not the basement/garage bands that covered their songs? Listening to The Janglebachs’ faithful and proficient renditions should have made me feel old, but it didn’t. It only made me feel good. After all, we are, as the song goes, never too old to rock and roll. As baby boomers and their slightly younger counterparts, the shadow boomers, head into our reclining years, we want to revel in the good, good, good vibrations of our musical past. We want to forget the paunches, the wrinkles and the gray hairs and move to the music that defined a generation. And we can indulge ourselves since we make up roughly 28 percent of the U.S. population and have the most dollars to spend. Reunion tours are the hottest tickets around these days. The Janglebachs’ playlist (www.janglebachs.com) reads like a coming-of-age soundtrack for boomers, one that has a shelf life like no other. Because one of the truly good things about the good old days, aside from Scooter Pies and bubblegum Slurpees, is and always will be, the music.